The sun shone on Kellamergh Park in Warton for the traditional showpiece finale to the Blackpool and District Youth League season – the Hogan Cup finals, kindly sponsored by Orange Soccer and Media Signs Print. For the youngest finalists, the heat provided quite a test of stamina, though the Under-7 match was played over three ‘thirds’ – each of 13 minutes – rather than two halves. And the destiny of the cup was in the balance until the last of these ‘thirds’, as the scores were tied 1-1 after the first and 2-2 after the second. Two goals in the final eight minutes sealed victory for the Maroons as Harrison Baptist and Sam Seddon both scored twice. Lytham had fallen behind in the first period only to go in front in the second. They were then pegged back at 2-2 to set up the decisive final ‘third’. Winning manager Stuart Harrison told AllStars: “It was a very tough game, and although six goals were scored there weren’t that many shots. While that final produced a feast of goals, one was enough for Kirkham Junior Reds to win the Under-13s final against Poulton Town . 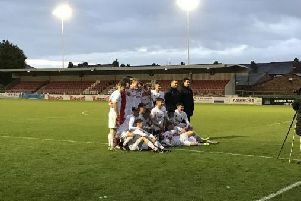 It followed a corner in the second half, when Benny Dodd intercepted an attempted backpass to set the Reds on course for a league and cup double. Poulton did have a goal disallowed and winning manager Lee Geraghty was surprised there were not more goals after both keepers made some top saves. He told AllStars: “It could have gone either way and was a real nailbiter. We panicked a bit in the first 10 minutes, and in the second half they had pressure and there were a few scrambles in our area. Poulton’s Harry Fallows was named man of the match. After completing their final two league games, Kirkham will go on tour to Holland at the end of the month. This has been made possible by a massive fundraising effort and sponsorship from Nolan Hardman Heating and Plumbing Engineers, The Richard Wilson Sport Foundation and Mick Threlfall Haulage. Hogan Cup finals day at Kellamergh Park began with the Under-14 decider between the top two teams in that Blackpool and District Youth League division, Foxhall Juniors and Squires Gate. They produced an excellent contest, which Foxhall won on penalties after a 2-2 draw. Foxhall started very strongly and moved into a 2-0 lead in the first half. Dylan Henshaw beat the defence to get into the box and win a penalty which he converted himself for the opener. Then winger Aidan Wright got the vital finishing touch in a goalmouth scramble to double the lead. Foxhall could have gone further in front when they hit the bar but Gate remained determined and pulled one back by half-time. They equalised with 15 minutes to go, and although both sides had chances of a winner the final went to penalties. Two saves by Foxhall keeper Michael Morris proved decisive as his side won the shootout 4-2. Winning manager Steve Shorrocks told AllStars: “We were quite dominant at times and should have gone further ahead but Michael’s second penalty save was brilliant. Squires Gate’s Imaan Hussain was named man of the match. By an amazing coincidence, the Under-11 final also produced a 4-2 penalty decider after a 2-2 draw. This was an all-FC Rangers showdown in which Rangers came out on top against their stablemates, FC Rangers Blues. The Blues twice led and missed a further chance to go ahead when a penalty was saved. Kobi Williams scored Rangers’ first equaliser with a free-kick from the edge of the area, and the second came via a Jake Wenham penalty with around five minutes left. Williams was on target again in the shootout and Marley Cheese netted the winning spot-kick. Man of the match was Rangers keeper Dean Price for his penalty saves in normal time and in the shootout. In the final match of the day, Clifton Rangers completed an Under-18s double with a 2-0 victory over Blackpool Rangers. Both sides had chances but Clifton were more clinical, scoring a goal in each half. Jack Butler headed the opener from a corner after half-an-hour. Clifton were grateful for a couple of one-on-one saves by keeper Jack Hargreaves before they sealed victory when Alfie Tomlinson jinked his way into the box to find the corner of the net. Central midfielder Tomlinson’s outstanding skill and movement saw him named man of the match. It was a fitting farewell for Clifton boss Andy Clarkson, who is leaving the post after 13 years to concentrate on his role as manager of non-league club Squires Gate FC. Clarkson told AllStars: “I think we took our foot off the gas at one point but we got control back in the second half. In the League, Kirkham Juniors Reds had sealed the Under-13 title in midweek with a 9-1 win at home to FC Rangers, while Blackpool Rangers Tangerines sealed second spot with a 2-1 success over Warton Typhoons. Kirkham Juniors Blues and Squires Gate Titans completed their season in the Under-14 division, the Blues taking the points with an 8-1 win. Poulton FC lost at home to Squires Gate Reds 0-1 but later in the week bounced back for a 2-1 win away to Thornton Cleveleys Whites.